ISLAMABAD: Federal Health Minister Aamer Mehmood Kiani said on Saturday that no compromise would be made on the healthcare system and it would be upgraded in line with the vision of Prime Minister Imran Khan. He said that incumbent government was determined to bring about promised reforms in the health sector, adding that they were striving hard to improve the health facilities for the masses. “Special attention was being paid to improving patient care in two major hospitals of Islamabad that are catering to bulk of patients not only from the capital but from other parts of the country. Expressing his views during a surprise visit to the Pakistan Institute of Medical Sciences (PIMS) and polyclinic hospitals, he said the government will make PIMS a model hospital and revamp the service and pay structure of doctors, nurses and paramedical staff since health, along with education, was the topmost priority of the incumbent government. 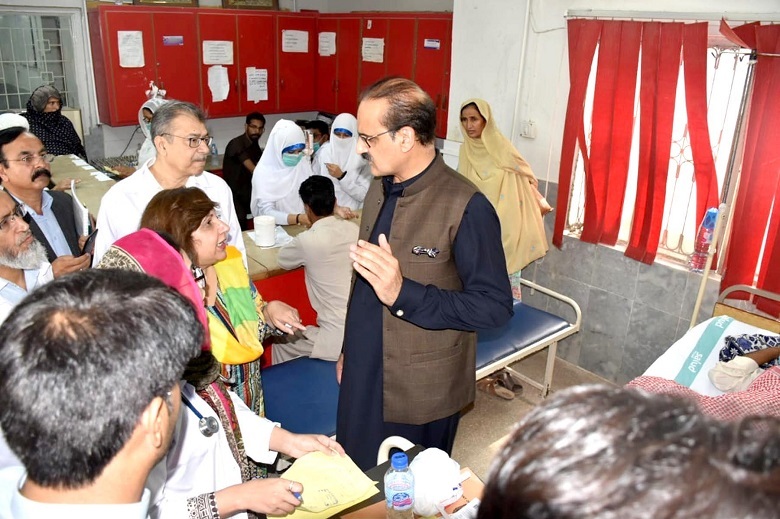 The minister on the occasion went around the OPD, emergency ward, cardiac center, orthopedic ward, nephrology and other departments of PIMS and appreciated the recent improvements in the hospital’s workings. The minister said that the previous government paid little attention to the health sector; however, he vowed that the present government would make all-out efforts to bring about the much-needed change in the health sector. “The government will increase the funds and human resource for improvement of patient care,” the minister said. On the occasion, a detailed presentation on projects and budget of PIMS was given by PIMS Executive Director Raja Amjad Mehmood. Later, the minister visited Polyclinic Hospital and surveyed its emergency, gynae and children wards. He directed the staff that no effort should be spared in providing best possible treatment to the patients, saying that there will be zero tolerance for negligence in this regard. The minister then visited the vaccination centre of polyclinic to monitor the immunization of children and mothers. He said all children of eligible age must be vaccinated to ensure their safety against deadly diseases. He said that Prime Minister Imran Khan was paying special attention to the health of mother and child; hence no stone would be left unturned to ensure provision of best mother healthcare facilitates in the country. The minister said that the government was well-aware of the challenges and problems in the health sector; however, at the same time it has a clear plan and vision to tackle these mounting problems. Talking to Pakistan Today, PIMS Spokesperson Dr Wasim Khwaja said that the federal health minister visited all the wards and appreciated the changes in PIMS during the last four months. He also confirmed that soon all admitted patients would be given free medicines whatever the cost may be. Dr Wasim said while surveying the radiology department, the minister vowed to provide modern machines and latest apparatus to PIMS.